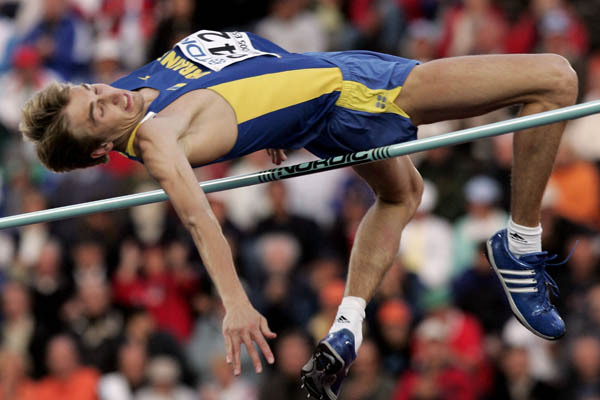 Ukrainian high jumper Yuriy Krymarenko already has a secure place in the annals of athletics history as one of the most unexpected gold medallists at the IAAF World Championships in Athletics but the 2005 champion wants to spring another surprise. "I think I can jump 2.36m in Osaka, anyway I hope so. The best in the world this year is currently 2.35m so if I can jump that height then it might be good enough for a gold medal. But beating someone like Stefan Holm is not going to be easy, he's jumping over 2.30m very regularly, and jumping 2.36m is not going to be easy either," said Krymarenko. The 24-year-old from Berdychiv, which is around 150km south west of Kiev although Krymarenko is now based in the Ukrainian capital, was his country's only medallist in Helsinki two years ago and the feat won him a host of awards at the end of the year. However, instead of flying higher and higher, Krymarenko has had his wings clipped in the last 18 months by a series of niggling heel injuries. After his 2005 World Championships victory, when he was the only man clear at 2.32m, which was just one centimetre short of his personal best set just seven weeks before which remains his top mark outdoors, he slumped to finishing a dismal sixth a week later at the World University Games. The only other competition he won in 2005 was an end-of-season city centre exhibition event in his native Berdychiv. The following year, when he should have been financially reaping the rewards of his success, he was only able to compete in three meetings, none of which he won, and had to miss last summer's European Athletics Championships. This winter he cleared an absolute personal best of 2.34m indoors before sore heels again dictated that he could not compete in the European Indoor Championships. "However, I'll be ready in Japan. Everything this year has been geared towards the World Championships and defending my title. I would not look too closely at my results up to this point although I am quite happy with them. I won in Luzern, improved by three centimetres in Lausanne and then by another three centimetres in Zaragoza," added Krymarenko, although since the interview he has competed with slightly less distinction in Kiev and Stockholm. Nevertheless, regardless of what happens in Osaka, nothing can diminish the achievements of Krymarenko on one of the few calm and dry evenings in Helsinki two years ago. He famously won his gold medal at 2.32m when, with eight men attempting that height, 23 of their first 23 attempts ended with the bar coming down. As the last to jump, Krymarenko knew that if he went clear that the gold medal would be his and grabbed his chance. He tickled the bar but the contact was not enough to dislodge it. 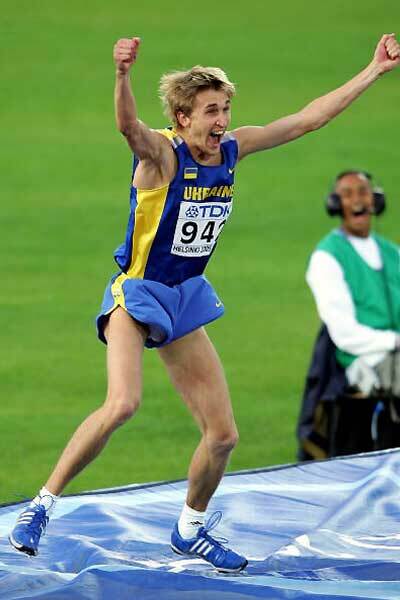 "The Ukrainian second-string jumper became the most unexpected global winner (of a men's high jump competition) since Robert Shavlakadze's Olympic win of 1960," comments the report in the IAAF Statistics Handbook for the 2007 IAAF World Championships in Athletics although aficionados of the event might argue that Gennadiy Avdyeyenko's victory at the 1983 World Championships, another Ukrainian with a prowess for literally rising to the occasion, was equally unexpected. Krymarenko, in turn, also has his sights set on emulating another Ukrainian high jumper who emerged from nowhere to surprise the world. "Ultimately I would like to break Rudolf Povarnitsyn's national record which was formerly the World High Jump record. My coach believes that I can jump 2.40m and that's his mark," added Krymarenko. Back in 1985, Povarnitsyn created shock waves around the world when the news broke that he had became the first man to clear 2.40m in a relatively low-key domestic meeting. It is fair to say that few pundits were expecting Povarnitsyn, who was then a jumper with no international credentials, to achieve that historic standard when the most likely candidates to achieve that distinction were considered to be either Germany's Dietmar Mogenburg or China's Zhu Jianhua, both of whom had held the World record and had been medallists at the Olympics the previous summer in Los Angeles. "Povarnitsyn's record a particularly important target for me because he got the record on my birthday, August 11. I was only two years old when he did it so obviously I don't remember anything about it personally, but plenty of people have talked about to me it as the competition was in Donetsk.